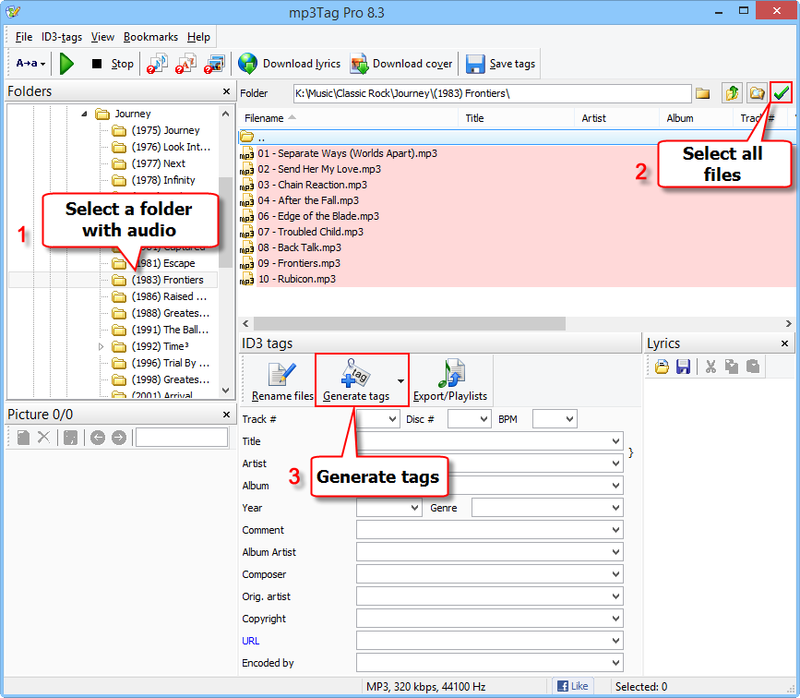 With mp3Tag Pro you can edit tags of your MP3, M4A, FLAC, APE, and other audio files, download missing tags from the internet, easily rename and sort your music, and more. There is yet another interesting feature that allows supplying music files with tags without using any internet resources. If necessary details are available in filenames and folder names, you can simply extract them into tags. This feature is the opposite to renaming files, and it uses pretty much the same logic. So, if you already know how to build custom patterns for filenames, you will hardly need any instructions on how to extract tags from filenames. As first, we select audio files that need to be tagged. 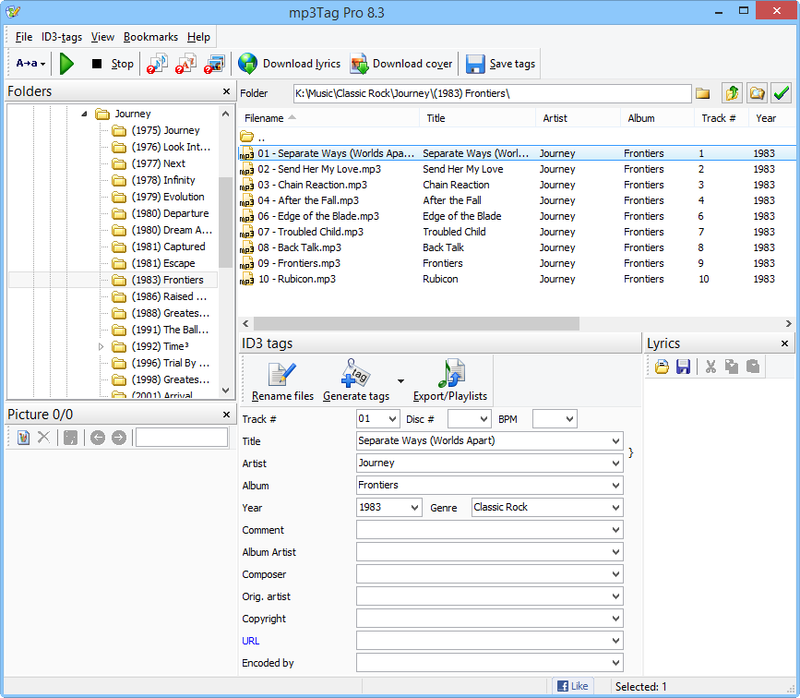 mp3Tag Pro works with all supported formats in the same way, so you can select a mix of MP3, FLAC, APE, OGG, M4A, AAC, and other supported files. In the "Folders" area on the left, select a folder (1). Files from the selected folder will appear on the right, in the main area. In our example, all files are highlighted with red, which means that they have no tags. This information can be saved into the corresponding fields of MP3 tags. Let's see how. Back to the first screenshot. To select all files, click the green checkmark button (2). Then click the "Generate tags" button below the list of files (3). Enter the correct pattern into the "Format" field. Make sure that "From filenames" is selected. "Fields from tags" can be set either to "Overwrite" or to "Overwrite only empty fields" (with the latter option, no existing tags will be changed). Fields that we plan to extract should be checked. When everything is correct, click the "Generate tags" button to extract tags from filenames and save them into your files. While steps 2 through 5 are pretty simple, the first step requires some more attention. (!) You can remove details only at the beginning of a path. Please note that we haven't changed any separator characters. Every space, backslash, bracket is in its place. This is important. This is how we enter it into the "Format" field. More information about formats: click here. 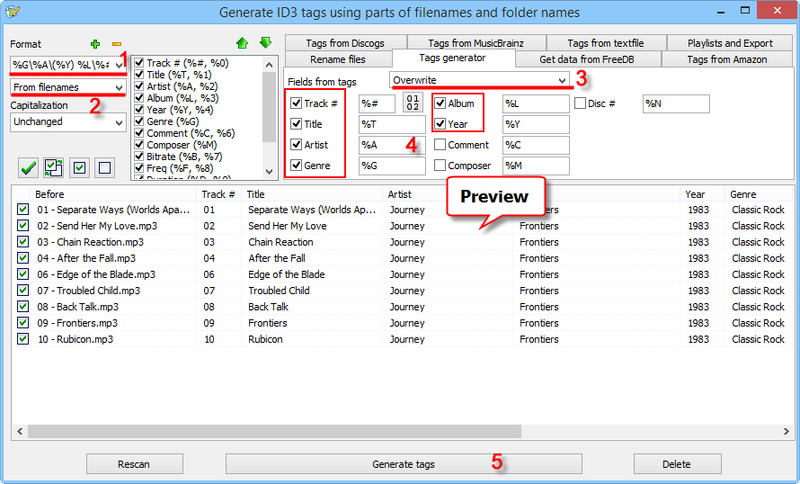 As you enter a filename pattern into the "Format" field, mp3Tag Pro shows a preview for your future tags immediately. Check information assigned to fields in the corresponding columns of the preview area. If everything is correct, click the "Generate tags" button below. Now we can download lyrics and cover art, add more tags manually, etc. With this method, thousands of audio files can be tagged at once, if their naming scheme is the same.